BEIRUT: What was meant to be a peaceful protest by thousands of Muslims in Beirut Sunday against the publication of cartoons depicting the Prophet Mohammad turned into a vicious riot, which left at least one person dead and 30 wounded. 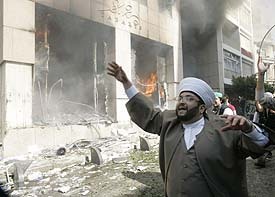 The Danish Consulate was torched, churches were vandalized and a number of properties and vehicles were damaged. Muslims carrying green and black Islamic flags and wearing headbands bearing the slogan “Prophet’s soldiers” joined in the global Muslim march against the recent reprinting by European newspapers of caricatures of the Prophet Mohammad by swarming the streets in front and around the 10-storey building housing the Danish Consulate in Beirut.